This winter, I've been keeping travel-size hand creams in every place conceivable: on the bathroom counter, on my desk at the office and at home, in my purse, on my nightstand. I suffer from dry hands and am constantly washing my hands (hello, seasonal germophobia), and I don't like interrupting my work to go searching for lotion in another room. Others must surely feel my pain, which is why luxe, sweetly scented hand creams make great stocking stuffers, standalone gifts (particularly if they come in gift sets that let you sample different ones), or the ideal beauty indulgence for yourself. 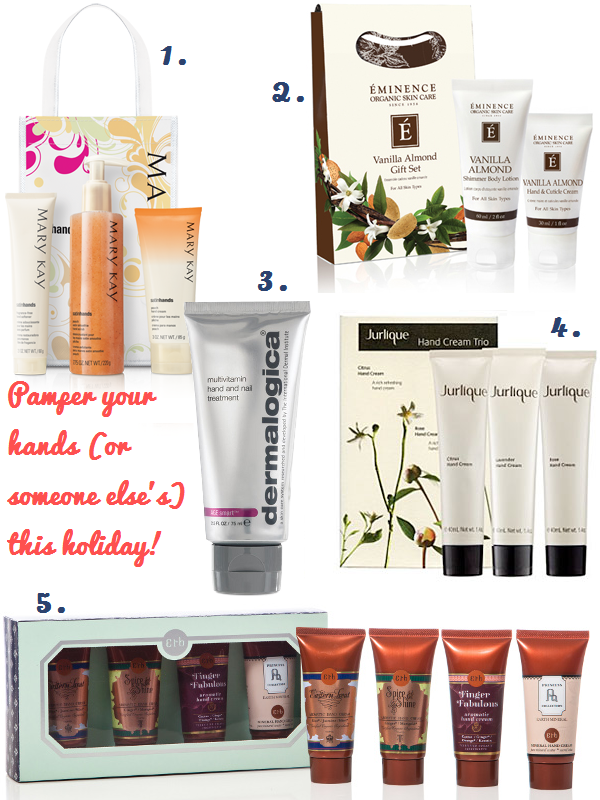 So without further ado, here are 5 ways to treat your own hands or someone else's to something special this holiday. 1. Mary Kay Limited Edition Vanilla Sugar Satin Hands Pampering Set ($51). This 3-piece gift set includes an exfoliating hand scrub, a hand softener that provides deep and immediate moisturization, and a lighter hand cream, all in a season-appropriate vanilla sugar scent. I keep the hand scrub by the bathroom sink as a reminder to exfoliate regularly, and it works. 2. Eminence Organics Vanilla Almond Gift Set ($30, available at Spa Boutique). Vanilla and sweet almond oil give the Hand & Cuticle Cream and Shimmer Body Lotion an intoxicating, all-natural fragrance. This limited-edition gift set is a terrific introduction to Eminence Organics for the uninitiated. 3. Dermalogica multivitamin hand & nail treatment (available at BeautyMark). Dermalogica's latest offering is like the Cadillac of hand creams. Its non-greasy formula not only moisturizes, it promises to even skin tone, fight the signs of aging, and condition nails to keep them from splitting and peeling. Tip: Keep this ultra-luxe lotion on your nightstand and apply before bed to reap the full benefits. 4. Jurlique hand creams ($32 for 40 ml, available at Spa Boutique). Rich formulas full of natural extracts, beautiful scents (citrus, rose, or lavender)...simply put, a hand cream you'll want to buy for others and be tempted to keep for yourself. 5. Aruhndara Helping Hands Gift Set ($49, available at Aruhndara). If a sunny getaway to Thailand is out of the budget this Christmas, a few spa-inspired Thai beauty imports might be the next best thing. The travel-size lotions in this set come in four subtle Asian-inspired scents, each one containing a different list of botanicals with different benefits for skin and nails. My favourites are the Princess Pa and Eastern Treat formulas. Although Aruhndara's products are new to Vancouver and North America, they've been a staple of Thai spas for many years. I think it's a great idea to have travel sized hand creams in several accessible spots at work/home/purse. Perfect chance (and great excuse) to have different brands and scents!